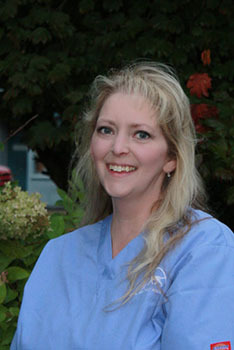 Constance joined SVA originally in 1995 after graduating from Pierce Community College with an A.A. in Veterinary Technology in 1993. Her veterinary interests include dentistry and complementary therapies. Constance’s great love of animals has led to her owning a practical zoo over the years. She currently cares for, Scooby Duke IV the Great Dane, Lacey the cattle dog cross, as well as four kitties named Mickey, Priss, Shikon, and Cheezy Puff. She also enjoys spending time with Shazam, her thoroughbred horse, Little Rusty rooster, Lucky the chicken, & the twin hens. As if that’s not enough, Constance also shares her home with Lizabeth the leopard gecko and her human family, too!